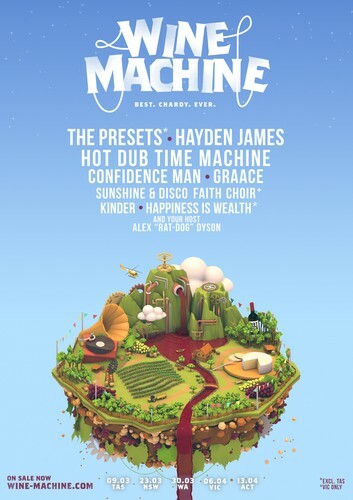 The Hot Dub curated spectacle "Wine Machine" returns in 2019, hosting their third annual, wine-cheese-sunshine-fuelled festival of live music and celebrations. The massive and proudly all-Australian wineup for the 2019 national tour has been announced and showcases some of the biggest names in electronic music along with the next crop of incredible Australian talent on offer. Overseeing the proceedings, your master of ceremonies as always will be international festival sensation Hot Dub Time Machine, who’ll be bringing his time entangling, party antics once again to the wine aficionados of Australia. Australian dance-music royalty The Presets will be bringing their enormous and spectacular live show to the Wine Machine stages, as will the omnipresent nicest guy in dance-music Hayden James with his unique and incredibly popular brand of baby-making house. Arguably the country’s most entertainment live act Confidence Man will have wine-enthusiasts dancing their rosé’s away while the incredible GRAACE will have us swooning, off the back of her triple j hit ‘Last Night’ and stellar debut EP Self Sabotage. Rounding out the lineup are the infectious Kinder, the luscious disc-house duo Happiness is Wealth and our host Alex "Rat-Rog" Dyson.